Sweden’s Johan Kristoffersson responded to PSRX Volkswagen Sweden team mate Petter Solberg’s quickest time in Q3 by being quickest in Q4 with a lap one joker to take TQ (top qualifier) in the Intermediate Classification at the World RX of Sweden. Kristoffersson beat Team Peugeot Total’s Timmy Hansen to the first corner in race four and led the Swede into the joker lap. Kristofferson later overtook Solberg and EKS Audi Sport’s Mattias Ekstrom when they took their joker on lap three. GRX’s Timur Timerzyanov won Q3 race three and was fifth quickest, Peugeot’s Sebastien Loeb won race one and was sixth quickest and GRX’s Niclas Gronholm won Q4 race two to make it into the semi-finals, beating GC Kompetition’s Jerome Grosset-Janin and Guerlain Chicherit, Chicherit slowed with a technical problem. As Gronholm moved into the semi-finals, OlsbergsMSE’s Kevin Eriksson was 11th quickest in Q4 but is 13th in the Intermediate Classification and will be first reserve for the semis. Kristoffersson will start semi-final one from pole position, joined on the front row by Timmy Hansen. Ekstrom and Loeb will start on row two with Team STARD’s Janis Baumanis and Gronholm on row three. 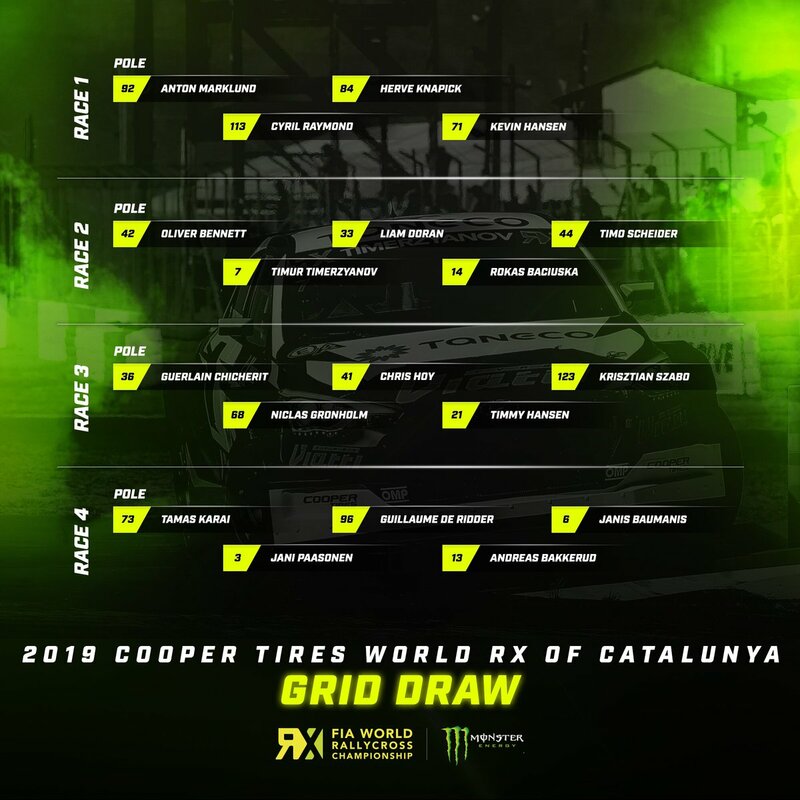 Solberg and EKS’ Andreas Bakkerud will start on the front row of semi-final two, Timerzyanov and Sweden’s Kevin Hansen will pair up on row two with Grosset-Janin and Sweden’s Robin Larsson on row three. Find full results from Holjes RX here.